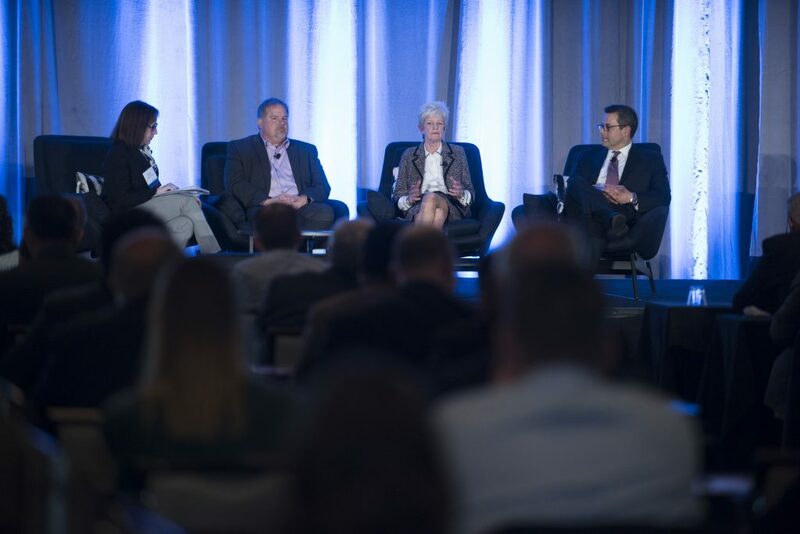 Elisa Wood, editor-in-chief of Microgrid Knowledge, discusses energy-as-service with Mark Feasel, Schneider Electric’s vice president of utility and smart grid; Andrew Marino, managing director at The Carlyle Group; and Karen Morgan, CEO of Dynamic Energy Networks (DEN). The interview took place at Microgrid 2018. Schneider Electric, DEN, and the Carlyle Group are partnering to simplify microgrid development for their customers, as well as reduce the risk involved in big energy decisions — many of which now include microgrids. They are doing so through an innovative business and financial model that reduces the risk for microgrid customers. Known as energy-as-a-service, the approach helps customers secure microgrid reliability without making large capital investments or assuming operational risk. The three companies launched their partnership with an initial investment of $500 million — a number which isn’t capped. Schneider Electric has been innovating in the energy market for 100 years. DEN, which launched six months ago, is an investor owner/operator of energy infrastructure. The Carlyle Group, one of the world’s largest investment firms, manages about $200 billion across 19 countries. 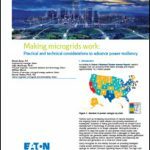 Mark your calendars for Microgrid 2019 May 14-16 in San Diego. The Carlyle Group’s interest in microgrids is part of its larger focus on private infrastructure investment, an opportunity in its “golden age” in the US, Marino said, with upgrades needed but financing scarce. The Carlyle Group’s Andrew Marino sees investment opportunities across sectors of the economy, including airports, trains, military bases, communities and even utilities that look to partner outside their traditional models. The Carlyle Group sees opportunities across a variety of sectors of the economy, including airports, trains, military bases, communities and even utilities that are now looking to partner outside their traditional models. Offering financing and capital for the microgrid market is a large part of what energy-as-a-service is about. But the concept is even bigger than that, said Microgrid Knowledge’s Wood. “It goes to a rethinking about how we manage energy ownership and operation,” she said. Schneider Electric’s Feasel sees microgrids as “a killer app” bringing more efficiency to energy use as pressure increases on the grid. Energy consumption isn’t quite as simple as it once was, especially for large energy users, who grapple with regulatory and technical complexities. Where should they put generators? What fuel should they use?Which renewables should they integrate into their onsite systems? Utilities used to make these kinds of decisions; consumers played a passive role. But the tides have turned, Feasel explained. Now, tech is changing — with onsite and distributed energy gaining appeal. At the same time, the regulatory environment is rapidly evolving. It can be hard for energy consumers to keep up. In addition, developing energy projects requires capital and carries risk. Today’s energy consumers want “a basic service, and not a huge risk,” Marino said. That’s where energy-as-a-service comes in. It begins with a conversation with the consumer to “really get to the bottom of what do they desire in respect to energy costs, sustainability and resiliency,” Feasel said. Those three items were once very difficult to achieve simultaneously. But thanks to microgrids and new business models, a more balanced outcome is possible. “Energy-as-a-service is the function by which we deliver the outcomes that we have all discussed and agreed upon,” he said. Energy-as-a-service has its roots in the energy performance contract model, but goes beyond that. “I call that (energy service contracts) 1.0 in the evolution of the market, and very useful in terms of savings opportunities, but it’s a consumption model, and it doesn’t take the risk away,” Morgan said. By using the energy-as-a-service model, Morgan and DEN can integrate performance contracts into a broader energy picture — but Morgan pointed out it doesn’t have to be a or-one-or-the-other situation. 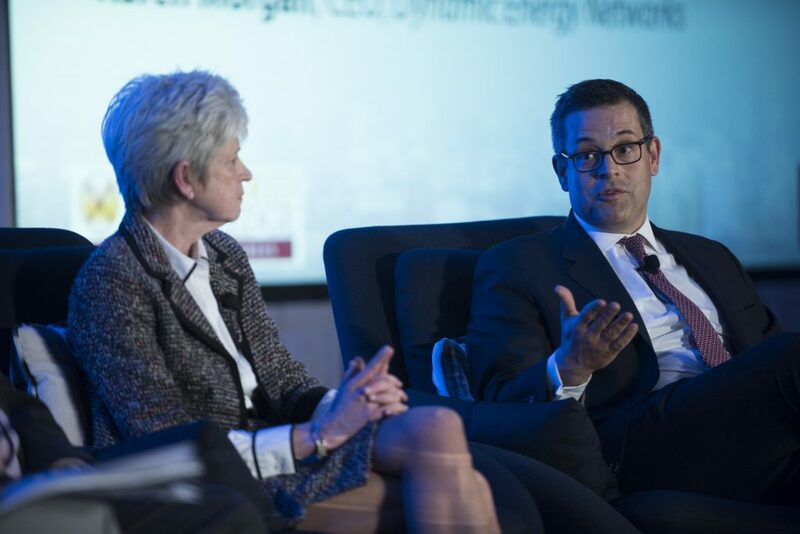 Energy-as-a-service goes beyond energy performance contracts, the panelists shared. One of the keys to successfully implementing the energy-as-a-service model is getting to the bottom of a clients’ needs, desires, goals, and energy objectives. So, the three companies make sure to ask their clients “lots of questions” about where they want to be in 10-30 years in terms of sustainability and their energy future. Morgan explained these contracts are meant to be long-term and big picture. And they represent an entity’s long-term energy goals. Once an entity has determined their goals and objectives in terms of energy costs, sustainability and resiliency, “that’s when you want to decide who to partner with and whether energy-as-a-service is the right option for you,” he said. The three companies plan to focus strongly on energy-as-a-service for airports, universities, and the industrial sector. They will start where the “low-hanging fruit” lies, Morgan said, places like New England, New York and California. (Editors note: These areas are viewed as favorable to microgrids because utility rates tend to be high and government policies favor distributed energy.) The partners are also working on projects in Puerto Rico. Feasel pointed out their scope could grow quickly, particularly as national companies adopt energy-as-a-service for their multi-state portfolio and energy needs. Follow Microgrid Knowledge on Twitter @MicrogridNews‏.